The Internet has taken the primary spot for information exchange in the twenty-first century, and for good reason. Several technologies that revolutionized information exchange came before: telegraph, telephone, radio, and television. All of these technologies changed the world and were supposed to be the ultimate platform, but will the Internet be different? 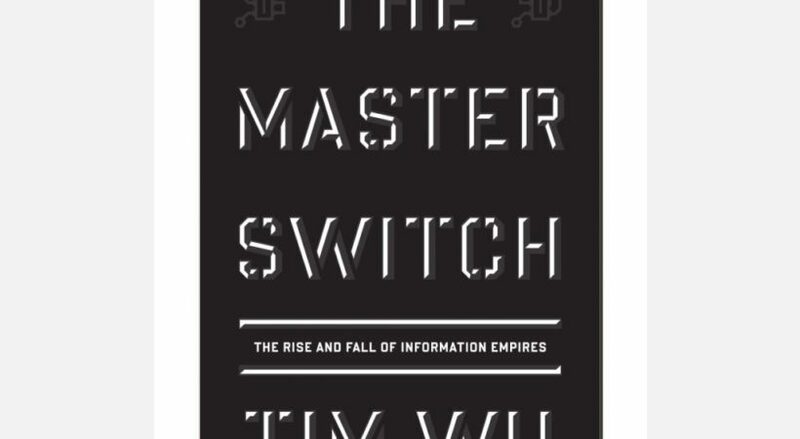 The Master Switch chronicles the history of information empires and whether the Internet is different. One of the most interesting tidbits is that elections were more or less altered due to withheld information in the age of telegraph. Since Western Union also owned the Associate Press, there was a major conflict of interest and negatively affected the election. Also curious is the amount of tampering that is done in production of new disruptive tech. The television was ready decades before it reached mainstream due to collusion between the FCC and the radio industry. FM radio was kept subdued in order to continue the success of AM radio. Radio itself started off as a deregulated market with experimentation done by amateurs, then consolidation occurred and edged out innovation. AT&T/Bell dominated telephony and colluded with the government to create an effective monopoly. The monopoly even extended to devices that attached to phones because AT&T/Bell convinced the government that such devices could bring the entire network down! Luckily, the government sponsored monopoly was finally broken up and we saw a massive explosion of innovation (including the answering machine, which was invented decades earlier!!). Ironically, breaking up AT&T/Bell led to the creation of Verizon and modern AT&T which are accused of destructive tactics themselves. The Master Switch is a dense read that takes some dedication to get through. If you can read its entirety you will definitely gain appreciation for how hard innovators work and start to wonder if the Internet will continue its dominance or be replaced by a different empire.